Enterprise applications are getting so much easier to use that CIOs' roles in selecting, deploying, and maintaining them is changing dramatically. It doesn't mean their roles are diminishing. Instead, as organizations prepare for the Digital Age and the Internet of Things, the role of the CIO will evolve. 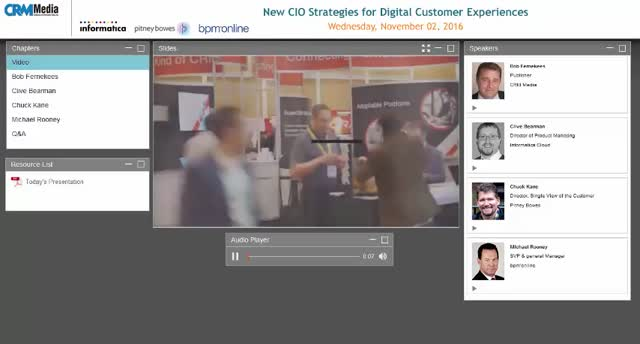 This roundtable reveals what CIOs must consider as they evolve their customer experience strategies. • Achieve the most through your CRM systems through relationship modeling between end users and IT. • Improve your CRM systems with analytical modeling in real-time. • Fuel emerging digitalization environments with connected, trusted, and compliant data across all CRM tools. • Enhance customers' journeys by driving insights across all digital and human touch points. • Minimize the redundancy of departmental cloud solutions. • Leverage process automation to gain organizational efficiency and control.